So now my design, it costs about $5 for the 4×5 variant (less than the dipper alone for some commercial options…) and is about an hour of work to make. Here are two pics of my 9×12 cm (also fits 4×5″) and 13x18cm (also fits 5×7″) finished results. A flat water bottle (your choice of size) from your favorite chinese supplier – $4.50 for the A6 – They change prices all the time maybe you can even find a better deal… Yes that is a flat rectangular water proof tank for under $5 yes, yes, yes, it costs less than buying the plastic and cutting and gluing it yourself… they even sell different sizes like real plate holders… the one I ordered disappeared but just search for “memobottle” or “paper bottle” on www.aliexpress.com and things seem to come up from lots of sellers. Just don’t pick the first one usually you can find exactly the same item for up to 30% cheaper if you look around a bit or search for synonyms. Wood screws, I used 4 4x40mm screws and 8 3x20mm screws but anything you have works – $0.5? A heat source. I used a heat gun, but candles, spirit lamps (for the sanderacsters), lighters, … would probably also work. Using the flexible piece of plastic/cardboard and marker mark the cutting around the perimeter of the bottle. Having a clear guide makes it a lot easier to cut straight using the hacksaw. Carefully clamp down the bottle this makes cutting a lot easier than hand holding it. File/sand down the cut edge. – Find a relatively heavy large (say 10 x 15 cm) piece of wood. You want this to be heavy to ensure the center of gravity is low enough to prevent the tank from tipping over easily. After building it I did a few bump tests with the tank filled (with regular water). With my piece I almost had to kick the tank for it to actually tip over. Make sure it is heavy enough so anything up to a gentle bump should not tip over the tank with your precious silver. Use the long screws (4×40) so affix two vertical pieces of wood to the base. The screws go through the base from the underside into the vertical pieces. So they are invisible when the holder is standing upright. Use the short screws to affix two horizontal pieces of wood to the vertical bits (see the photo of the finished think at the beginning of the article). Cut a piece of plastic from the large piece. In my case I used the edge of the lid as a Grip for the paddle. Make sure the plastic is thick enough of the paddle will be too floppy. Clamp down the bottom bit of the paddle between two thin pieces of wood. The thickness of the wood controls the thickness of the paddle grip. Cut two trapezoid bits of plastic from the back side of the paddle. This makes smaller plates easier to remove from the paddle as you can grab them by the edges. Insert the paddle along with the thickest,largest plate you plan to use (3mm glass in my case) in the tank. Remove paddle and plate. Mark the water level as “MAX”. This avoids overflowing the tank when you fill it to far with silver when inserting the plate. Note that for aluminium plates there is less volume displaced so you may need to mark several “MAX” levels. If you want to travel with your tank filled you should make a lid (I didn’t do this, bottles still seem safer somehow). How to do this has been explained before just check the following video (the action is at 3:40 as embedded in the link). When done you’ll notice it quite nicely pours from the the tank. I was most worried about this but the fluid doesn’t run down along the edge of the tank but pours nicely into the funnel. Not sure how you can influence this behavior maybe by careful filing of the edge. Or more/less sanding of the edges so the water “sticks” more to the edge? 4×5 untested but it’s big enough in theory. Sadly enough this just barely doesn’t fit 8×10 being only 7.7″ wide. 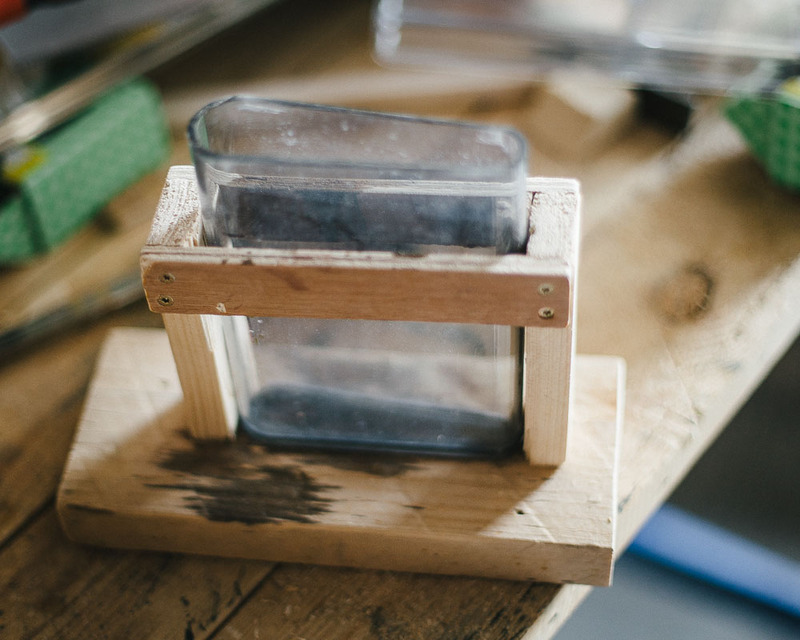 Use a regular darkroom tray or something else like a baking tray. Silver nitrate will not attack most common plastics so any plastic container should generally be safe. (Note the salted collodion is generally not considered plastic safe, both the solvents and iodide in it may attack plastics.) While this is probably the cheapest option (especially if you have the tray already) there seem to be several disadvantages to it. It takes up more working space than a vertical tank. Especially relevant if you work in a confined space like a darkbox or tent. You need to switch the lights off while the plate is getting ready the tray. Turbulence, lots of it, wit a tank it is easier to insert the plate in one hopefully laminar move. It’s easy for dust and other debris to get into a tray, silver nitrate is expensive stuff so we want to care for it the best we can. No use being stingy on a tank if the silver in it is wasted which may well end up costing more than you saved. Furthermore, silver nitrate is toxic, aggressive stuff you ideally want it contained as much as possible. Make your own tank from acrylics or glass. This seems to be the current state of the art in home-brew dip tank design (links here, here and here). However I hesitated to do it like this because. They are probably best if you want something bigger, say 8×10. I am still considering this for the 30 x 40 cm holder I need to hold full plates in my camera.